Buongiorno! I can’t think of anything more Neapolitan to eat for breakfast with an expresso than a Sfogliatelle. Sold from 1818 from a pasticceria on Via Toledo, this delicious little shell is best eaten warm. It combines the crunch of the many layered, sugar dusted pastry, the smoothness of the ricotta, the sweetness of the candied fruit and a hint of vanilla and cinnamon. They are also satisfyingly hard to pronounce, with the first letters making a ‘shh’ sound in the Naples dialect and with a silent ‘gli’ in the middle, leading to confused looks when ordering one (or many). For those wanting a crack at making them, look at the recipe here by WordPress blogger Chef in Disguise. In Italy, March 19th is the Festa di San Giuseppe, or Feast of St Joseph, husband of the Virgin Mary and a ‘fatherly symbol of love, compassion, kindness, generosity and acceptance’. So today is also Festa del Papa, Italian Fathers’ Day. Many southern Italians are named in his honour. In Naples, to celebrate the day, the cafes are absolutely crammed with trays full of thousands of Zeppole, a delicious fried or baked doughnut topped with sweet cream and garnished with an amarena cherry. They are a very southern Italian thing; Don Pasquale Pintauro, a pastry chef from Naples, created Zeppole di San Giuseppe from his road side bakery in 1840. Over the last week, I’ve tried both fried and baked Zeppole and prefer the latter; they are lighter than their fried cousins yet still pack a sugary punch and go perfectly with a morning coffee. A great authentic recipe is here. One of the first collages by Italian Futurist Umberto Boccioni. 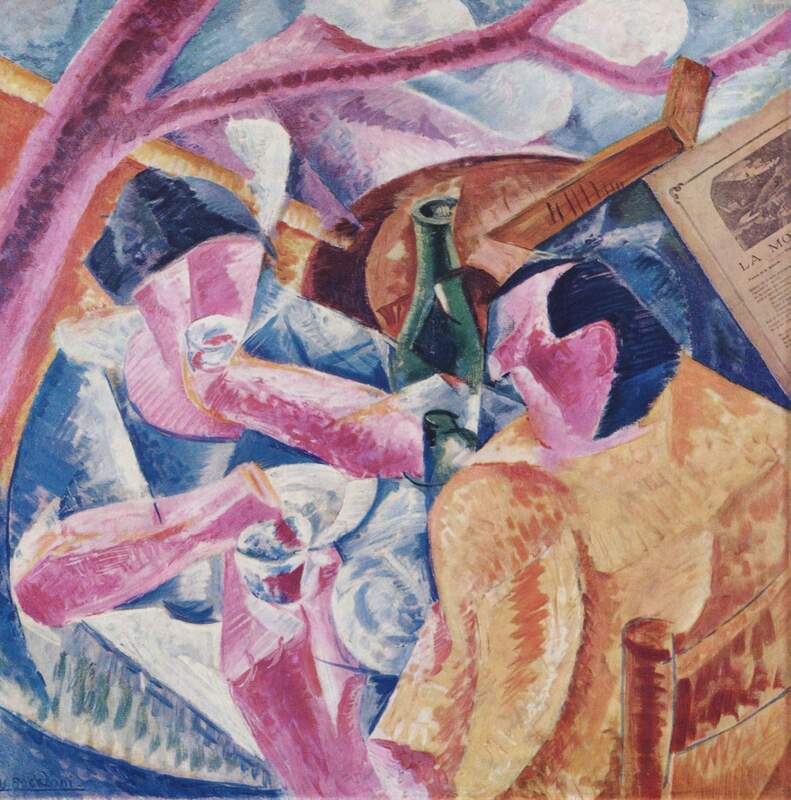 Now in the very wonderful Museo del Novecento in Milan, the triangular cutout of a page at the top right hand side carries the lyrics of a popular song that, together with the mandolin, allude to the musical accompaniment of the pre-war lunch enjoyed by the two figures in the shadow of Vesuvius. What do Neapolitans eat on Christmas Eve? 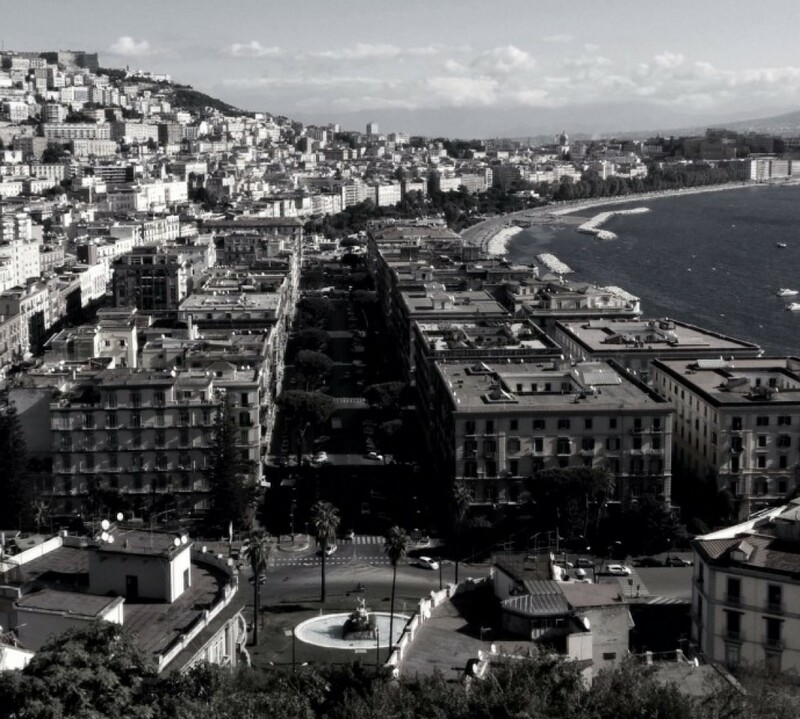 But there is much, much more about Neapolitan cuisine than just the lazy pizza (and southern Italian) stereotype. Below are some lovely dishes traditionally eaten in Naples on Christmas Eve, inspired by this list (with recipes) on Napoli Unplugged. Cena della Vigilia di Natale is a leaner meal, without meat or fat, eaten before midnight Mass. 3 tourists eat spaghetti and drink wine in Capri on 1 September 1939. In the background are the Faraglioni rocks. Lemon trees here in the south, and especially on the Amalfi coast, are rightly famous and grow everywhere. We have two in the garden which bear fruit for most of the year. I was looking for a light Summer desert menu with a lemony zing and decided upon this simple but stunning tart from the Two Greedy Italians – Antonio Carluccio and Gennaro Contaldo. Both from near Naples, they cooked the dish outside on a terrace high above Amalfi. The recipe uses candied cedro, a citrus fruit from the south of Italy, with pungent lemon zest sprinkled on the finished tart. But you can use candied lemon peel too. The result, as shown above, is a very light, delicate tart which is lovely either on its own or, as recommended by the cooks, with Summer poached pears. This version is from the BBC website. The very beautiful Corricella harbour on the small island of Procida. The setting for the film Il Postino, Corricella is a photographer’s dream; a working harbour of fishing boats, small pastel-coloured houses, no cars, deep blue skies and a few simple cafes along the water’s edge. For lunch, take the 1300 ferry from Pozzuoli and you can sit down at just after two o’clock for a leisurely meal of assorted, sparklingly fresh shell fish, pasta with fresh anchovies and tomatoes and an assortment of fried fish. After a carafe of ‘vigorous’ white wine and a glass of homemade limoncello, you can catch the 1700 ferry back to the mainland. We always eat at ‘Vincenzo’s’ or Bar Graziella. Simple, with white plastic chairs set under wide umbrellas, the charismatic eponymous owner is a local legend and always dressed in a white singlet. He was a part time film actor and inside the restaurant, an old fisherman’s cave, there are plenty of photos of Vincenzo with various celebrities who have visited his bar.